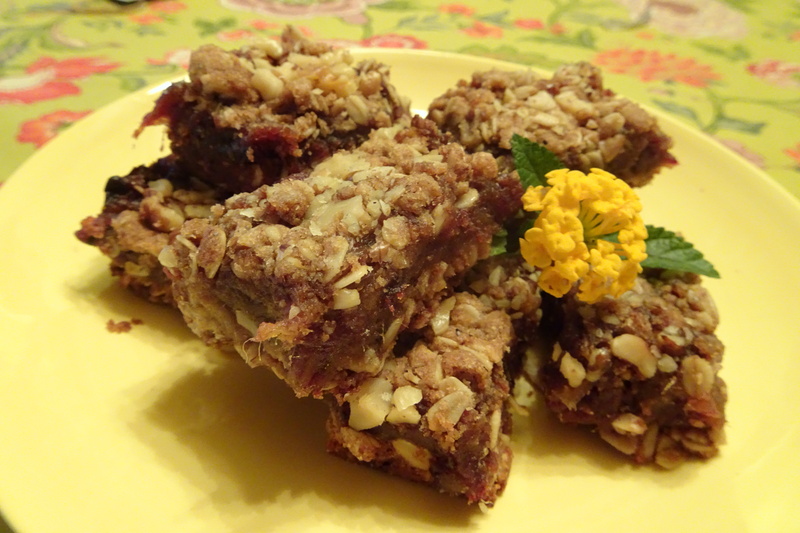 Mesquite meal, oats, and dates combine for a sweet and nutritious snack. Now that the temperatures have dropped, we can once again turn on the oven to bake some goodies. Carolyn here today to talk about one of my favorite recipes. Because both dates and mesquite meal are quite sweet, you can cut way back on the sugar. My version cuts two-thirds of the sugar in the original recipe. Although you could actually completely leave out the sugar in the base, in baking at least a little sugar is needed to help with texture and browning. Adding the warming spices of fall make the bars special. I added some cardamom, because it is unusual in our culture, and a little cinnamon. If you happen to have some of Amy’s mole mixes, a tablespoon of one of those would add real punch. In order to make the finished date bars easy to remove from the pan, line the pan with foil or parchment paper with some wings on the sides to lift out the finished bars. I hate it when I have to hack at bars to get them out of the pan. Use a little more than half of the crumb mixture on the bottom; I figured I used about three-fifths. Line the pan with paper or foil to help lift out the finished bars. You will have plenty of time to cook the date filling while the base bakes. I was surprised how quickly the pieces of chopped dates softened into a smooth paste. 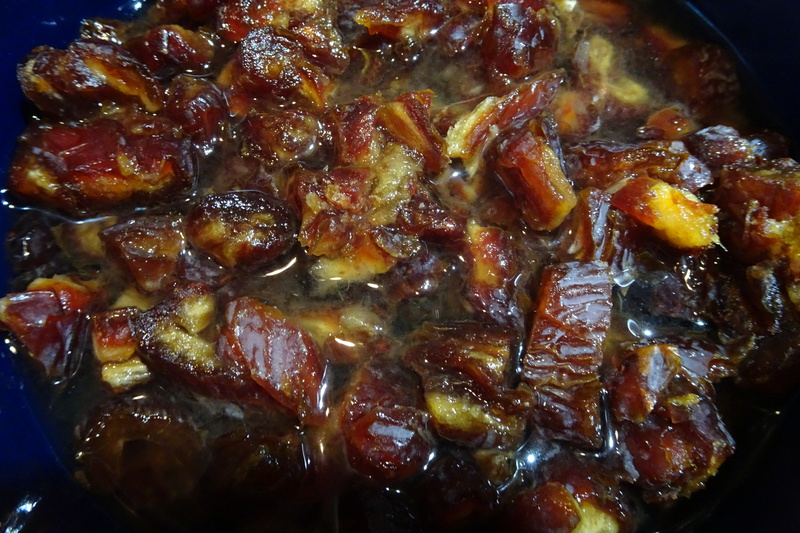 Dates and water cook quickly into a smooth paste. Use low heat and stir frequently. in the pan an hour or so before lifting them out with your paper or foil. I cut mine into 24 pieces. They could be even smaller. Cut small pieces because the bars are quite rich. 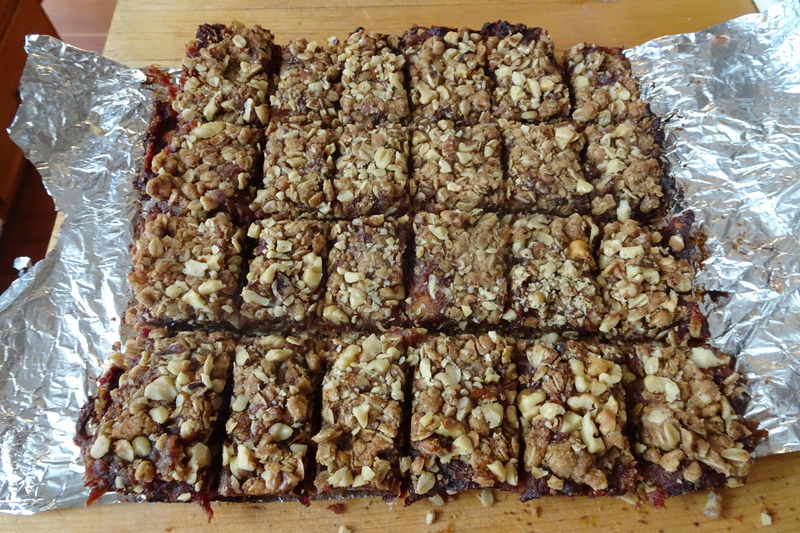 I made these bars to take to a potluck. They would also be a good addition to a selection of Christmas cookies. Ummm….delicious with a cup of coffee or tea. Preheat oven to 350 degrees F (175 degrees C). Line a 9-inch baking pan with foil or parchment paper with an inch or two extending over the edge. Spray with cooking spray or spread a tiny bit of oil over the lining. In a large bowl, combine oats, whole wheat flour, mesquite meal, salt, brown sugar, and baking soda. Add butter and mix until crumbly. 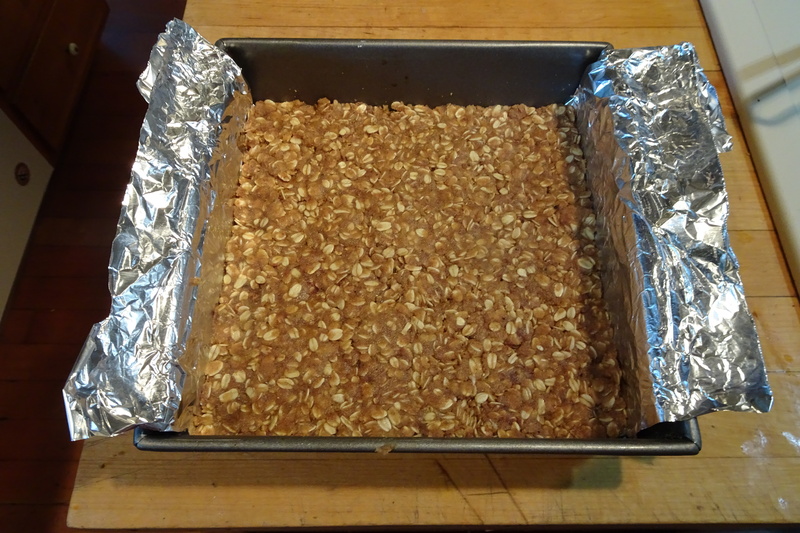 Press a little more than half of the mixture into the bottom of a 9- inch square baking pan. Bake 15 minutes. While the crust is baking combine dates and water in a small saucepan over medium heat.. Bring to a simmerl, and cook until thickened, probably around 5 minutes. Stir in lemon juice or orange juice concentrate, and remove from heat. Remove crust from oven when it is beginning to brown at the edges, spread the filling over the base, and pat the remaining crumb mixture on top. Sprinkle with chopped nuts if using. Bake for 20 to 25 minutes in preheated oven, or until top is lightly toasted. Cool before lifting from the pan. Cut into small pieces (I did 24) as these are very rich. 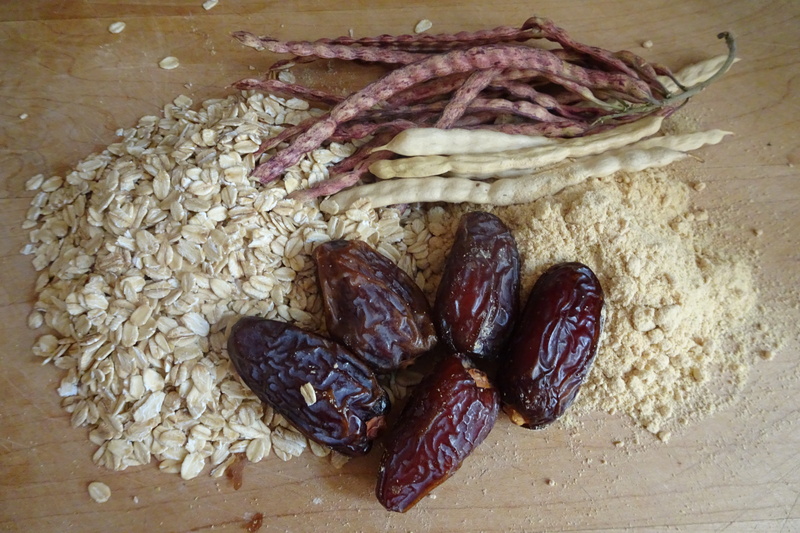 Carolyn Niethammer writes about the foods of the Southwest, both wild and domesticated. Find her books at her website, at Native Seeds/SEARCH, at at on-line booksellers. We need the recipe! Thanks! My finger slipped and I “published” rather than “previewed” before I put the recipe on. One of life’s little screw-ups. It’s there now. Took them to a potluck last night and they were well received.